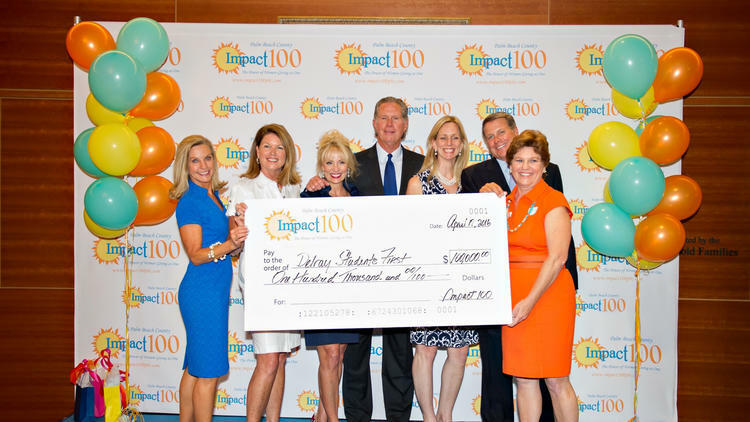 Impact 100 recently hosted its “Palm Beach County Grand Awards Ceremony.” Susan Duane and Karen Sweetapple, co-presidents of Impact 100 Palm Beach County, presented checks totaling $532,000 to seven nonprofit groups in southern Palm Beach County. This year, 532 women each made a $1,000 donation to become an annual member of the grant-making organization. Organizations that received donations include American Association of Caregiving Youth, Delray Students First, Alzheimer’s Community Care, The YMCA of South Palm Beach, Camelot Community Care, Florida Atlantic University Foundation and Flamingo Clay Studio of Lake Worth. Impact 100 Palm Beach County is a charitable women’s organization celebrating “the power of women giving as one.” Its goal is to make it possible for a visionary idea to become a reality in a way that impacts the local community. Since the first Grand Awards Ceremony in 2012, Impact 100 Palm Beach County members have donated $1.65 million to make positive changes in southern Palm Beach County.